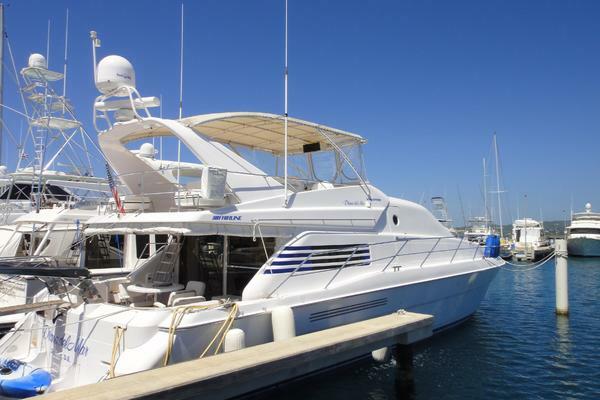 76 Lazzara with five staterooms and the preferred bridge layout. This boat is very well outfitted with a "black out" style acrylic enclosure on the bridge, newer granite throughout, custom granite table on the front deck and custom bench on the aft deck, drop down custom flat screens on the bridge and aft deck, two Yamaha wave runners with newer engines, twin davits - one on each side of the bridge deck. Additionally there is a factory installed wine chiller and additional storage and closets not found on other models. 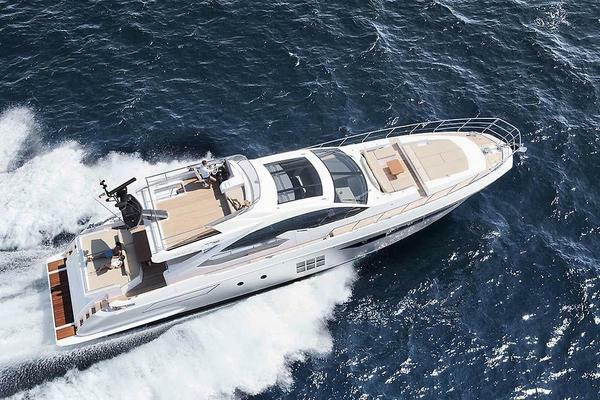 All Lazzara factory sea checks were completed up until 2013. Tremendous opportunity for a large quality, American built yacht with so many amenities. Her owners have priced her to be attractive. West Florida Yachts would love to guide you through a personal showing of this 76' Lazzara 76 Grand Salon 1995. This yacht for sale is located in Fort Myers Beach, Florida and priced at $499,000. For a showing please contact us by filling out the form on this page and we will get back to you shortly! Ample exterior space, large and spacious salon and a five stateroom design all with en-suite heads. Large galley with full size appliances and a country kitchen. Master and twin VIP staterooms down and a v-berth and bunk room forward. Laundry located both in forward v-berth area as well as in hallway from VIP to master. Large sun pad on bow deck, multiple seating locations on aft deck, huge bridge with L-shaped seating as well as a bar with stools and a sink - all within the bridge enclosure. Bridge deck features location for dinghy storage, an exterior grill and refrigerator as well as another L-shaped settee with a table. All exterior areas are greatly enhanced with a state of the art JL Audio system with Fusion zone control. Custom drop down TV's are tied in with the AV system and located on the bridge and aft deck. All exterior lighting is done in blue LED. Interior features are primarily original but in great shape. Both port and starboard ships doors lead to the bow deck from the lower helm on the port and the galley/country kitchen on starboard. There are both port and starboard hinged storage lockers that are very large capacity. Center located large bow sun pad with option for hinged up back rests. Directly in front of sun pad is a Bowmar round deck hatch which leads to v-berth. There is also a custom granite table that is positioned just forward of the sun pad to serve guests that are relaxing on the sun pad. The current owners have elected to also set teak chairs in the far forward area of the bow deck for an additional sitting location. JL speakers that are independently zone controlled add an audio aspect to this area. Windlass with foot controls and very pronounced stainless bow decks round it out nicely. Full size sliding door with tinted glass and stainless door fixtures leading into salon. To starboard of salon door is a ladder leading up to the bridge deck. Custom upholstered bench with storage underneath to port of salon door. There is a custom free standing granite table directly to aft of this bench. Zoned JL speakers with their own dedicated fusion zone control. Teak decks, boarding gates to both port and starboard. The aft portion of the bridge deck has two corner lounges with upholstered tops, underneath storage and access to deck top cleats for clean line storage. In the direct middle of this area is a matching granite top. Slightly to port is the stairs going down to swim platform and engine room. Both port and starboard actuated pods which can be used for the two Yamaha wave runners or impressive storage areas for coolers, water toys, dive gear, etc. Engine room door. There is also a passerelle with controls (in engine room) and an area used to store the "tide ride" style boarding ladder. Acrylic bridge enclosure with opening windows to both port and starboard as well as the forward center piece directly above the helm. The aft portion of the enclosure features a door that slides in a track to go from the enclosed bridge to the bridge deck. All enclosure acrylic is done in the "black out style" which gives the boat a great look. Forward and starboard is the sliding door which leads down the steps to the galley. Centered in the forward area of the bridge is the upper helm. There are three pedestal mount captains chairs, ships wheel to center, analog display for all I.S.I.S. data, a Garmin 5208, spotlight control, fusion head unit with all zone control, bow thruster joy stick, rocker switches. Hardtop has two overhead fixed skylights, accent LED (blue) overhead lighting, JL speakers and subs and a custom drop down flat screen in a flush mount box. Starboard bridge has a granite bar with bowl style counter top sink and faucet, corner cabinetry and three bar stools. To port is a L-shaped lounge with matching upholstery and throw pillows. Exiting the bridge to the aft you will encounter a counter top immediately to port. Under this counter is an electric grill and below is a refrigerator for serving this deck area. Flush setting davits to both port and starboard so launching tender is a breeze regardless of what side of the boat you are docked up to. Davits are fully controlled with up, down, in, out and rotation. Wired remote is used for control of each of these. Design on these are awesome as the davits fit right into the ships overall appearance and lines. It is hard to detect where these are at first glance. Tender is design to fit full width on this boats bridge layout. Removable chocks make it a breeze to use this area for guests and pleasure versus hauling your tender. To the aft and starboard of this area is a deck hatch which accesses the ladder which leads to the aft deck. Forward to port is a L-shaped lounge with removable upholstery as well as a table for hanging out in the open air. Rear facing JL speakers add an audio component to this area as well. This vessel had all yearly Lazarra factory "Sea Checks" done up until roughly 7 years ago. For those of you not familiar with this program please ask. It was and still is the most innovative and impressive factory offered program to keep their fleet in top condition. All original equipment but she is in good operating condition. Boat is used very often which is excellent as it shows that all systems are in working order. Continually maintenance is done on this vessel to keep it ready to roll. Within the last two years this vessel has done multiple trips to the Bahamas, Keys, east and west coast of FL. This boat has been painted in Awl Grip. Interior salon and galley floor has been changed to composite flooring - besides that all original interior. This vessel has not been jacked up along the way with any sort of ill advised re-fits. It can be used as it sits or is prime for a re-fit to the new owners standards and preferences. *This vessel gets used often - hours may be higher than what is noted. Lower helm has an I.S.I.S. - integrated ship information systems by RGM, upper helm has a smaller monitor which gives all ISIS information and alarms.